Hundreds of people gathered Thursday night in the Dena’ina Center in downtown Anchorage for the rally, which was headlined by Palin but also featured a number of lower wattage political luminaries appearing by video. At the event, billed as a “Change DC” rally, Miller said the campaign was only five days away from changing the nation’s capital. “And I’m not talking about Obama’s kind of change,” Miller said. Those who are criticizing him “represent the way of the past, not the future,” Miller said, and again called on his supporters for their prayers for his victory over Democrat Scott McAdams and Sen. Lisa Murkowski. Miller upped the ante from some of the other speakers, who had urged those attending the rally to drag at least two of their friends to the polls, too, on Election Day. Miller asked the crowd to persuade 10 people who are on the fence about him to vote. Firing up the crowd before Miller’s speech, Palin took a swipe at both of his opponents, Murkowksi in particular: “One is an out-of-touch liberal, and the other happens to be the mayor of Sitka,” she quipped. Only a few other moments rated as much applause as Palin’s appearance at the rally: a senator from Oklahoma questioning whether climate change is real, and a new commercial from the Miller campaign attacking Murkowski. Other speakers over video included radio talk show host Lars Larson, former presidential candidate/former Arkansas Gov. Mike Huckabee, tea party darling Rep. Michelle Bachman, R-Minn., and Sen. Jim Inhofe, R-Okla. Sen. Jim DeMint, R-S.C., whose political action committee is one of Miller’s biggest supporters, also appeared over video. According to the information detailed by Art Moore in his article and documented with audiotapes, there is another problem with Sestak – his involvement with CAIR. Since his election to the House in 2006, Democratic Senate candidate Joe Sestak has fended off strong criticism of his relationship with the Council on American-Islamic Relations, a federally designated terrorist co-conspirator shown by FBI evidence to be a front for the Palestinian terrorist group Hamas. 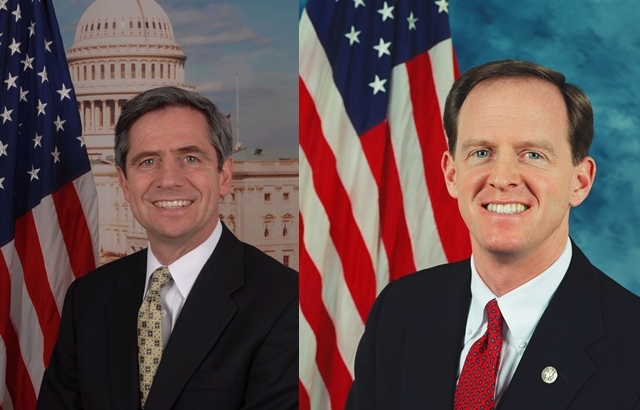 Now in a tight race with Republican Pat Toomey for Sen. Arlen Specter’s open seat, a report asserting Sestak was caught in a lie – denying that he was ever in the home of the director of CAIR’s Pennsylvania chapter for a fundraiser on his behalf – has resurfaced. CAIR Pennsylvania’s Iftekhar Hussain affirmed to WND’s Aaron Klein yesterday in a recorded interview for Klein’s WABC radio show that he hosted a fundraiser for Sestak during the 2006 congressional campaign. But in an April 9, 2007, radio interview with WPHT’s Dom Giordano in Philadelphia, Sestak told a caller he had never been at the CAIR leader’s home. The interview, along with a recorded excerpt of a November 2006 lecture by Hussain in which the Muslim leader referred to the event, was reported at the time by Pamela Geller on her Atlas Shrugs blog. Sestak was the center of controversy last spring when he revealed the Obama administration offered him a position if he would drop out of the Democratic primary to clear the way for the incumbent, Specter. Republicans charged the offer was illegal, but Democrats insisted it was legitimate because the position was unpaid. Sestak went on to defeat Specter in the Democratic Party primary. CAIR describes itself as a civil-rights group, but FBI evidence points to its origin as a front group for the Muslim Brotherhood and its offshoot Hamas, and the Justice Department designated it an unindicted co-conspirator in the largest terror-finance case in U.S. history. The Washington, D.C.-based group, which has more than a dozen former and current leaders with known associations with violent jihad, is suing WND and two investigators behind the best-selling expose “Muslim Mafia: Inside the Secret Underworld That’s Conspiring to Islamize America”. As WND reported, NPR announced the termination of Williams’ contract after CAIR issued a statement calling for the taxpayer-funded network to take action. Sestak is now the target of a $1 million ad campaign by the Republican Jewish Coalition that criticizes him for his involvement with CAIR, his support of a civilian trial for Sept. 11 mastermind Khalid Sheikh Mohammed and his backing of partisan congressional declarations against Israel. Critics also point out Sestak hired a former CAIR staffer, Adeeba al-Zaman, to direct his local office. Al-Zaman was CAIR’s director of communications from April 2005 to September 2006. Sestak claimed he was not aware of the then 23-year-old Al-Zaman’s background with CAIR when he hired her, although he interviewed her three times. The group is governed by a three-person board of Bill Kristol of Fox News and the Weekly Standard; evangelical political activist Gary Bauer; and Rachel Abrams, a writer married to former senior Bush administration official Elliott Abrams. “Sestak raised money for an anti-Israel organization the FBI called ‘a front-group for Hamas,'” the ad’s narrator says, referring to CAIR. “Sestak signed a letter accusing Israel of ‘collective punishment’ for blockading Hamas in Gaza. Sestak refused to sign a bipartisan letter affirming U.S. support for Israel. Critics note Sestak did sign a January letter lambasting Israel for using “collective punishment” against Palestinian residents of Gaza. The letter sought to put pressure on Israel to ease up on its blockade of the Hamas regime.